Three different sets of versions of the files appear. The version I should’ve grabbed is in yellow. Simply put, I grabbed the wrong version of the driver files. I needed the 64bit version (the biggest file: 131.0 MB for Fall Creators Update). I grabbed the 80.8 MB version and didn’t realize it. Finally, I grasped that the error message I got when trying to force install the 32-bit driver told me I was in the wrong, albeit unknowingly. It wasn’t a complete waste of time, though. That’s because working through the process refreshed my memory about a number of useful tips and tricks for dealing with drivers. 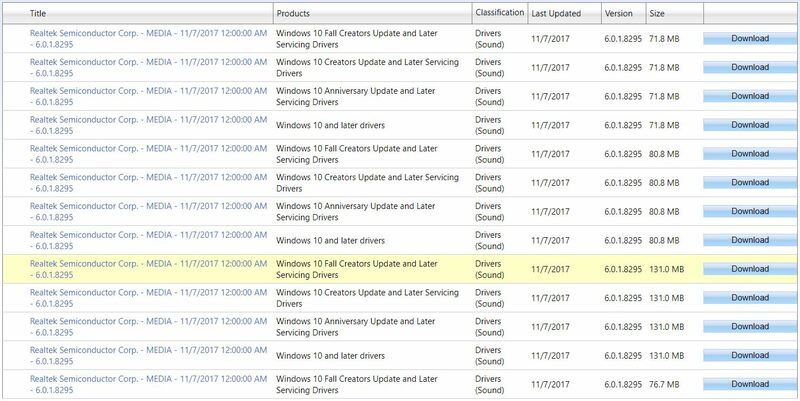 Because these tips apply reasonably well to any drivers you might fetch from the Microsoft Update Catalog, I recite them here. The Latest Realtek High Definition Audio Codecs sticky thread at TenForums remains your best source for these drivers. TenForums has a peachy tutorial named “How to Install a CAB File in Windows 10.” If you don’t already know this, it guides you through the process. If you’re tempted to force-install a Windows Driver in Device Manager/Update Drivers, pause to investigate before forcing anything. I was clued in that something was wrong for several reasons. First, the browse function came back and said I had the latest and bestest driver already installed. Second, the force function warned me that the driver I pointed at was incompatible with my hardware. That’s Microsoft’s way of telling you trouble may follow soon. I realized my error when I went back to look at the CAB file I’d downloaded. It was less than 100 MB in size, when I knew I wanted the biggest one for my 64bit setup. Note to Microsoft: why not label downloads explicitly as 32- or 64-bit? Remember you can use Driver Store Explorer (aka RAPR.exe) to check the true name of the .inf file you want to replace when updating. It told me I had the right driver file in the 32-bit directory. I correctly concluded something fishy because Device Manager didn’t like it. That’s how I figured out that the HDXRT4.INF file wasn’t the version of that file that I needed. Sure enough, as soon as I removed the original download and replaced it with the correct version, Device Manager was able to find and install the proper driver, no forcing needed. That reminds me, and should remind you, that when the square peg won’t slide into the round hole, the proper response is to stop and think rather than to reach for a bigger hammer. Please keep that in your list of Realtek HD Audio Driver Tips, and general driver update knowledge, somewhere near the top! ‘Nuff said.